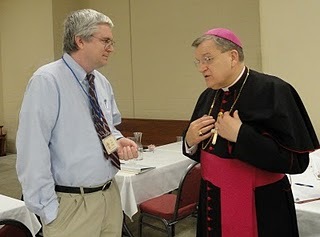 Canon Lawyer Ed Peters (pictured right), who now serves under Archbishop Burke (pictured right) as a "Referendarius" at the Vatican's office of the "Apostolic Signatura" is now speculating about who Pope Benedict might name as new Cardinals at the next papal Consistory. Since it is Cardinals who vote in papal elections, the choices will be in some way consequential for the Church's future. Rome basically shuts down in August, and here in the USA summer vacation is winding its way toward Labor Day. So it’s a great time to speculate on the next Consistory, rumored to be scheduled for as early as this Fall, but more likely in the Spring of 2011. Or, not. We'll see. Setting aside a few variations in their modern structure, Consistories are chiefly important in that new cardinals are formally named thereat, and it's cardinals (under the age of 80) who elect popes. Since the time of Paul VI, the number of eligible electors in the College of Cardinals has been officially capped at 120(pace John Paul II, who at one time had some 133 eligible electors on the list!). Benedict XVI is not likely to exceed the cap, nor will he, at age 83, lightly assume that he will have several more chances to shape the College over the years. So, if he wants to impact the direction of the College of Cardinals, my guess is, he will do so at his next opportunity. If the Consistory were held today, Benedict could name 13 new cardinal electors; if he waits till the end of August he could name 14, and if he goes into October he could appoint 17, maybe 18. That would be a sizeable class, and some significant reshaping could be accomplished by naming so many new cardinals at one time. H / T Te Deum laudamus! Photo: Fr. Z, who also blogged about the conference at which he took the photo.